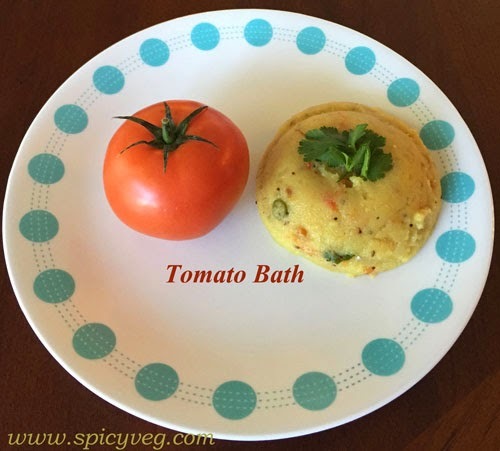 Tomato bath is a popular breakfast made in most of the Indian houses known for its delicious taste and quick cooking process..Tomato Bath is a bit more tangy and spicy than regular upma. And It is very easy to make and quite filling too. 1. Dry-roast ravva until it just begins to turn brown, then keep aside. 2. In a large pan, heat the cooking oil. 3. Add mustard seeds and wait for them to sputter. Then add cumin seeds, urad dal, channa dal,ginger, green chillies, red Chillies and chopped onions and fry until onions are slighty done. 4. Now add pinch of turmeric. Add the copped tomatoes ,and cook till the tomatoes are mushy now add salt and 3 cups of water, and bring to boil. 5. Add the roasted rava, reduce the heat, and mix quickly to avoid lumps forming. 6. Tomato Bath is done when all the water is absorbed by the ravva. 7.Garnish with chopped cilantro leaves and lemon juice. 8.Serve hot with coconut chutney. Note: While adding the semolina (ravva) to the boiling water, lower the flame and keep adding the semolina little by little to the boiling water to avoid forming lumps. Stir continuously while adding the semolina to the boiling water.